This is my all time favorite verse. Maybe because I crave stillness so much. I don’t sit still well. If you’ve spent much time with me you’ve probably noticed. I’m the one in the church pew with my knee bouncing up and down for no apparent reason. If I’m not actually up and running around, my knee, nose, or ears are twitching. Even as I type this my foot is shaking. It’s like my body doesn’t know how to just be still. I’d LIKE to be able to sit still, it sounds really peaceful. I wonder if I ever get truly still even while I sleep? I’m a single mother to two girls and I work full time. Needless to say, there is very little physical stillness to my days. Even on the days I don’t have my girls, I find myself busy doing things and running errands. My personality is also very “go, go, go”. I really enjoy being active and social. But, I love the idea of stillness. Physical stillness evokes the characteristics of peace and calmness that we all crave so deeply. When we can’t be physically still, can we be calm and at peace? Can we know that God is active right along side us? Can our souls be still amidst work, life, and kids? Can our hearts find peace when the storms rage and the questions bombard us? The answer is yes. Can we have a disagreement with a friend and be still? Yes. Can we see 10 patients in one day, come home, make dinner, do homework, run baths, race to bed, and feel peace while doing so? Some days run smoother than others, but the answer is yes. Yes, because in those moments when we wonder “how am I supposed to do this?”, or “how do I fix this?”, or “I SURE could use some help around here!” He is there. 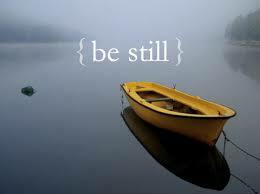 He calls us to “be still” because He knows our minds and bodies get weary. He’s aware of the pace and asks us to be still because He is in control. In a world where physical stillness is hard to come by, He asks us to be still and KNOW that He is GOD. Just be still…..